AMD's latest pixel pounding beast is more of a mild overhaul of an existing GPU than an all new architecture. AMD says the chip itself is new, but functionally it's identical to the existing Radeon HD 4870. With 800 shaders and 40 texture units, that's no bad thing of course. It also has the same 1GB frame buffer and 256-bit bus as the top version of the 4870. Without any new features, then, what exactly is the point of the 4890? In a word, clockspeed. AMD has upped the chip's core operating frequency from 750MHz on the 4870 to 850MHz. Meanwhile, the clockspeed of the board's GDDR5 memory edges up from 900MHz to 975MHz. At first glance, these are hardly dramatic steps forward. However, the 4870 was already an awesome graphics chip. Perhaps not the very fastest single GPU you could buy, but not far off and certainly the most efficient and elegant graphics processor in the world. By comparison, Nvidia's competing chips look like pretty blunt instruments. The Nvidia GeForce GTX 285 may be the fastest graphics chip on the planet, but it's inordinately large and relatively expensive. 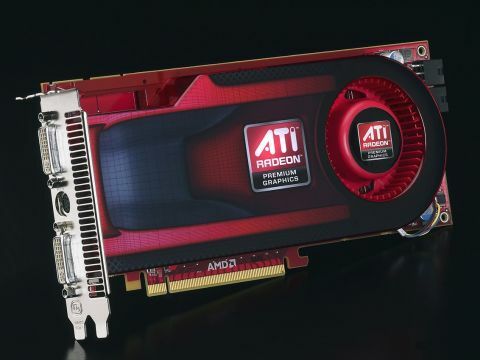 Getting back on message, while the new Radeon HD 4890 doesn't bring a huge leap in stock operating frequencies, the pre-launch internet scuttlebutt suggested we should pay close attention to the chip's overclocking prowess. What's more, AMD itself even hinted that 1GHz and beyond on the core might just be possible. More on that in a moment. First, how does the chip stack up at stock clocks? Frankly, pretty much as you would expect given the increase in operating frequencies. At the epic 2,560 x 1,600 resolution, it delivers 51fps in the relatively undemanding but fantasically fun Call of Duty 4, thereby carving out a moderate 5fps advantage over the existing 4870 chipset. That said, it still can't quite match the GeForce GTX 285's 58fps showing. Moving on to Crysis: Warhead, possibly the most brutal test of graphics performance there is, the new 4890 puts in a playable 26fps performance with details set to maximum and a resolution of 1,680 x 1,050. That's 2fps more than a 4870 and a nicely symmetrical 2fps down on the GTX 285. As for overclocking, our Asus-branded 4890 board can't quite deliver on the 1GHz hype. 965MHz is all it has in the tank. Still, that's enough to bring it level with the much more expensive GeForce GTX 285 in terms of Crysis performance. All of which is jolly nice, but exactly how much will you have to pay for it? The 4890 slots in just above the Radeon HD 4870 (that board lives on) but below the Radeon HD 4870 X2 dual-GPU board. As you read these words, the usual UK online retail suspects should already have the card on offer at around the £200 mark. That's obviously great value compared to a GTX 285. But is it worth the extra £40 over a 4870? At stock clocks, probably not. But with near 1GHz capability, well, we'd find it hard to resist. And finally...you will not be surprised to learn that Nvidia has prepped a spoiler for the 4890 in the shape of the GeForce GTX 275. It's essentially a down-clocked GTX 285. Nvidia claims it's faster across the board. And it may well be. But pricing will be key – can Nvidia really afford to sell the 275 for as little as £200? We'll soon see.